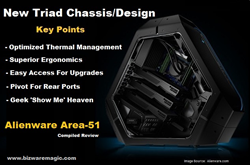 The newly re-designed Alienware Area-51 is featured on Bizwaremagic.com - this powerful gaming desktop is turning heads with its new triad look and massive specs. Alienware's upcoming extreme gaming desktop Area-51 is sporting a new triad look and massive specs. Alienware's newly re-designed and re-imagined gaming desktop Area-51 is featured on Bizwaremagic.com, a 12-year-old site which operates a handy online Laptop Computer Guide for its visitors and patrons. 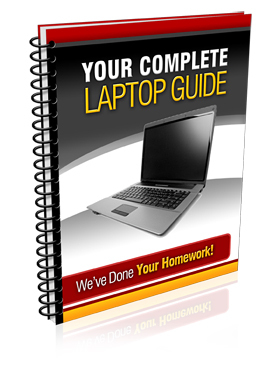 As an ongoing component of this guide, Bizwaremagic regularly presents compiled reviews/summaries of noteworthy laptops, computers and gaming devices of every description. The Alienware Area-51 is a remarkable debut - not only for its groundbreaking triangular design, but also because it sports some of the latest advancements in computer gaming technology. First, the novel triad shape and design is completely different from the old traditional rectangular boxes which house most desktop computers. Even for gaming desktops, you can put on as many flashing lights as you want - it is still a rectangular box. In comparison, the Area-51 has a triangular design which allows for easy access to all hardware inside. The side panels can easily snap off to reveal all components - this is great for doing upgrades or modifications. It is this easy access which makes the Area-51 a geek's or gamer's "Show Me" heaven. And the Area-51 has a lot to show. It will come with Intel's new Haswell-E i7 Extreme 6-core or 8-core processors, which are factory overclocked for maximum performance. This device is one of the first 8-core computers we have seen, although gamers will know both Xbox one and PS4 have 8-cores. In addition, there is Intel's new X99 Express chipset with up to 32GB of the latest 2133Mhz DDR4 memory. There will be up to five SSDs and/or hard drives. Plus, the Area-51 can hold up to three graphics cards - supporting dual, triple or quad GPU configurations. All this computing/processing power results in Ultra HD 4K gaming with 11520x2160 resolution that can be displayed on up to three monitors. The device also has a 1,500-watt power supply. One would expect "heat" would be a problem but Alienware claims the unique triad design keeps many of the components separate and adequate venting/cooling can be accomplished by drawing fresh air in from the front and ejecting warmer air out the rear. Liquid cooling is also standard on all models. Some of the other noteworthy features include Bluetooth 4.0 and the latest 802.11ac wireless protocol which prioritizes streaming video and gaming, reducing lag times. Obviously the device will have Alienware Command Center 4.0 which can program nine lighting zones with 20 colors and 512 trillion lighting combinations possible via AlienFX. The Area-51 will weigh around 45 pounds so the grips/handles on top of the triangular device will make it easy to pick up and carry. Foreseeing any changes, the Alienware Area-51 will be available for order sometime in October of this year. Gamers will already know the price-tag on a fully maxed gaming system like this will be expensive. Starting or lower-end models will be more budget friendly. To find out more about the Area-51 gaming desktop click here: http://www.bizwaremagic.com/alienware_area-51_compiled_review.htm or check out these top rated gaming laptops: http://www.bizwaremagic.com/best_gaming_notebooks.htm All products/companies mentioned above are registered trademarks of their respective owners and companies.